Hits at my blog always spike when news of alleged hydrogen peroxide bombing al Qaeda men make the front page. "Terrorism suspect Najibullah Zazi plotted for more than a year to detonate homemade bombs in the United States, had recently bought bomb-making supplies from beauty supply stores and was looking for 'urgent' help in the past two weeks to make explosives, an indictment charged Thursday," reported AP today. "[Najibullah Zazi] rented a suite at a hotel in his hometown of Aurora, Colo., authorities charge. The room had a kitchen, and subsequent FBI testing for explosives and residue in the suite found the presence of residue in the vent above the stove. "In July and August, Zazi bought unusually large amounts of hydrogen peroxide and acetone -- a solvent commonly found in nail polish remover -- from beauty supply stores in the Denver metropolitan area ..."
If true, and if the evidence of explosive ingredients or concentration of hydrogen peroxide is substantial, Zazi will be sent over -- probably for life. The various documents, focusing on the last .pdf which indicates a frantic search for hydrogen peroxide and acetone, on display at Cryptome, are particularly damning with regards to the accused man. 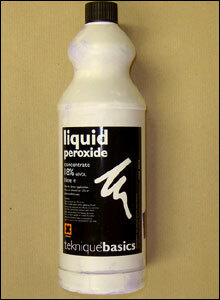 In the UK, there have been three bomb plots which employed peroxide. Most recently, I blogged about the Airplane Plot Liquid Bombers. For them, concentrated hydrogen peroxide was the oxidizer for a primary of Tang citric acid/sugar powder concentrate. In the London tubeway bombings of a few years ago, also known as the 7/7 plot, peroxide bombs in satchels were employed. A third plot concerned what DD dubbed the Chapati flour bombers, after their primary ingredient. The Chapati flour gang was inept. Their bombs fizzled and pictures of their makings and ruin were entered as evidence in a British courtroom, sent around the world in news stories. 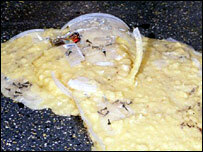 The above picture, of a failed peroxide and flour bomb on the floor of a bus, looked like your average bowl of overturned breakfast mess. And acted about like it, too. There are many tricks to making these things, details not included in recipes posted around the Internet, which is where they're scrounged up. 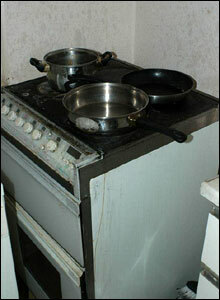 One of the tasks involved is concentrating hydrogen peroxide, often attempted by evaporation on a stove in some grubby apartment. However, because such people are quite often ineffective, or arrested before they can move forward, does not in any way ameliorate the uncharitable and anti-social nature of the activity. An entire archive of pieces on jihadists and peroxide bombing, accumulated over the past few years, is at my blog here. Another hydrogen peroxide-based explosive, TATP, is discussed here. With regards to the Zazi case, recipes for this material were things he was searching the net for. In terms of threat, this writer leans toward putting Zazi in the same league as the Chapati Flour Gang bombers: stumbling and desparate but someone who is taken off the street and banged up for a good long time. And if there is any good news in this depressing tale it's that it is some evidence that despite the passage of years, al Qaeda has shown little if any talent for improving many of its methods. They're still reliant on idiots who comb drugstores and beauty salons for makeshift ingredients after a beggar's trip/trawl around the Internet. The very poor terror bomber's starting ingredient of choice after a couple net surfing sessions. Tracking the Zazi gang's interest in peroxide bombs through Google Analytics. Another worthy post at Armchair Generalist. You entirely miss the point of terrorism! It's not what you blow up, it's what your enemy believes you can blow up.